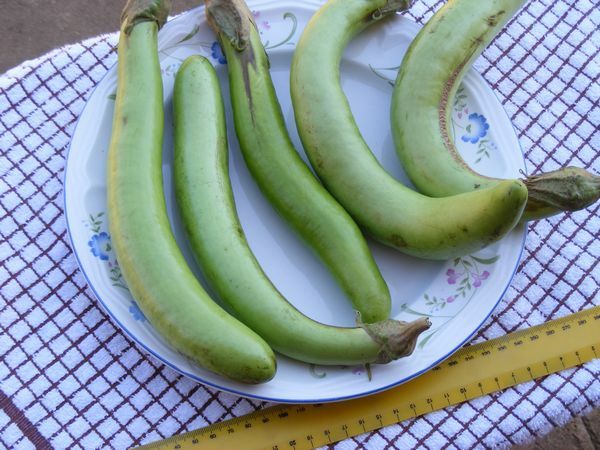 Heirloom from Thailand - one of the most popular long green eggplants grown in Southern Asia. An unusual short eggplant up to 40cm high with soft branches that produces slender 30-35cm long light green fruits. 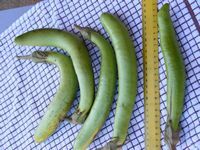 If the plants are staked, the fruits can be kept straight for over 3/4 of the length, making for impressive filets. Needs adequate water and full sun. Prefers a soil pH of 5.5 to 6.8. Slice the fruit in half and check the seeds - it should be light-colored - if the seeds are black, they are too ripe, and the eggplant will be bitter. You do not need to peel the fruit. The skin is very soft, so be careful not to bruise. Long Green Eggplants have a very mild flavor, and are excellent stir fried with garlic, bean sauce and Thai basil. Rich source of dietary fiber - help regulates smooth bowel movements, lowers blood cholesterol and blood sugar levels. One cup serving of eggplant would contain approximately 10% of the recommended dietary fiber. Eggplants contain small amounts of vitamin C, vitamin B1, vitamin B-3 and vitamin B-6. The potassium in the eggplants is beneficial for those suffering from low blood pressure levels and it also regulates the beating of the heart. Other essential minerals contained in it include potassium, manganese, magnesium and copper. Contain phytonutrients like flavonoids, caffeic acid and chlorogenic acid. The flavonoid Nasunin in eggplants, has high levels of antioxidant properties and is known to be a scavenger of free radicals, thus protecting the cells of the body. Nasunin is also known for its ability to protect the fats surrounding the cell membrane of the brain. The chlorogenic acid it contains is known to be the most potent antioxidant that displays antimicrobial, antiviral and antitumor abilities and plays an important role in the prevention of many diseases.